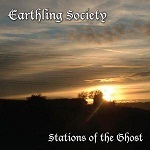 Review: "Earthling Society: Stations of the Ghosts" - Sea of Tranquility - The Web Destination for Progressive Music! Intergalactic prog rockers Earthling Society are known for their ability to create modern psychedelic space rock, and with Stations of the Ghost, they have committed another fine work of spaced out, epic rock music. Ambiance is the keyword of this release. While we are dealing with "music proper" rather than ambient soundscapes, Earthling Society the textures of the music itself, the use of atmospheric synths and echo-ladden vocals generate are very ambient feel that is pretty much ubiquitous on the album. I find it especially interesting that, although a totally different type of music, Earthling Society, through use of echo-ladden vocals, achieve the exact same ambient effect as artists operating within atmospheric black metal and funeral doom metal do. The album is actually pretty consistent, yet varied, as Earthling Society draw on a vast repertoire of musical expression, taking the listener from otherworldly gardens of lush arrangements, into the sci-fi word of spacey effects, across tundras of cold and dark atmospheres, through funky town, across exotic deserts to the misty mountains of psychedelia. While the songs are generally quite long and there can be no doubt that this release qualifies as progressive rock, the music is mostly straightforward and lacks the technical and complex aspects associated with many other progressive rock acts. Ambient and easy to lose oneself in, this is not music that fits any occasion, but if you are in the mood for a psychedelic journey through space, you should not hesitate to give Stations of the Ghosts several spins.